In the box, kids… Santa resists the opportunity of accepting letters from children. WHAT a miserable way to treat children. Father Christmas is clearly putting an appearance fee ahead of his believers and we’re naming names: Australia Post is to blame for corrupting the Jolly Fat Man. Snail Mail Central is spruiking a PR push to inveigle kids to get their letters to the North Pole pronto presumably, given the vagaries of the now pitiful postal services, so hopeful correspondents stand half a chance of getting a reply from Santa this side of Easter. But what’s with the hand-out photo? 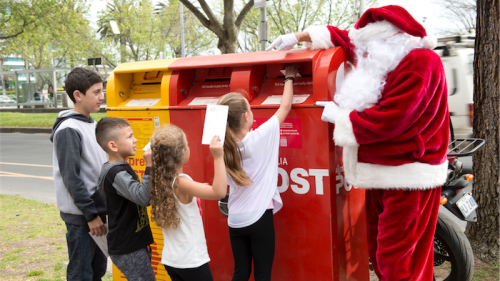 There’s FC bearded, besuited and perfectly able to take the letters off the kids himself, but no, the outstretched finger tells the trusting little angels to bunk off and stick their tiresome wish lists into the postbox. A NEW CEO and they’re busy rearranging the deckchairs at Aunty. The latest is that pragmatically branded ABC Local Radio will have a new visual and aural identity from January 9. As well as a new logo, ABC’s capital city radio stations will change names, dropping each station’s helpful frequency; to wit, 666 ABC Canberra will now be, steady, ABC Radio Canberra! Well, that should make all the difference, Michelle. Deep in the wilds of Melbourne Avenue. THE rustic vista (pictured above) is not from the wide, wild fields of Yass, but of the median strip on Melbourne Avenue, one of the main avenues to Parliament House. 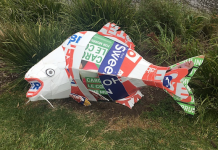 “Is Canberra going broke?” our inner-south snout innocently wonders. While the real answer to that probably transcends grass cutting, former senior Treasury official Khalid Ahmed has stuck his troublesome head up again to demonstrate (with graphs) that the ACT Labor government, despite the promises, hasn’t had a sniff of a Budget surplus for years and that it’s not getting better, it’s getting worse. In fact it’s in deep trouble. And the gnomes in the Treasury counting house, those glorious architects of the “out year” surplus mirages, have the gall to say Khalid’s got it all wrong. 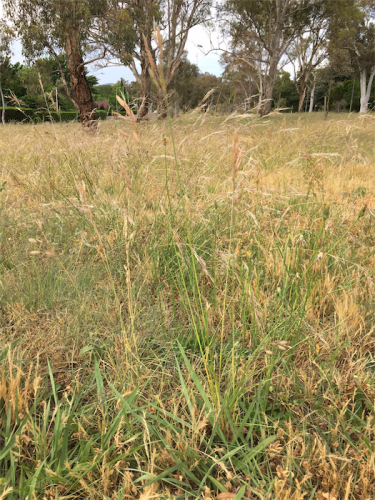 LIKEWISE the sentiment of reader Geoff Davidson who alerted Access Canberra to the overgrown, under-mown grass between Henty Street and ACT government compound in Haig Park, pictured. “Routine mowing not good enough. One cigarette today and you have a fire,” he wrote. In return he got blown off with bureaucratic blah blah and the reassurance that his “service request has been forwarded to City Presentation for review and will be placed on the routine mowing schedule where appropriate.” Looks pretty appropriate to us. APPARENTLY, it’s what Australian women are doing 15 times a month that’s keeping the publishing industry alive. A survey by the Australian Romance Readers Association revealed that 55 per cent of those surveyed read more than five bodice-ripping books a month, and of those 9 per cent read more than 15 romances a month. Romance is the largest single category of books in the world and accounted for $100 million in sales in Australia last year. Unsurprisingly, love-hungry men accounted for only 15 per cent of the market. READER Cathryn Ollif blew us a justifiable raspberry following last week’s CC item on Kofi Annan making a televised visit to a dinner at the Press Club. We stupidly described him as the “outgoing” UN secretary-general, which gave the appearance of our overlooking his successor Ban Ki-Moon’s decade in the job. “Presumably you meant the ‘former’ secretary-general. Language still matters – at least to some of us,” sniffed Cathryn. We stand contrite and corrected.